This unique mango cranberry guacamole is full of sweetness, crunch and creaminess! The perfect healthy dip to serve at a party or gathering! I know that I’ve totally been MIA for the past week…my apologies!! Matt and I went to this amazing marriage retreat this weekend organized by Family Life. It was SO good! We spent the whole weekend listening to inspiring couples talk about how to build a great marriage…there were lots of activities and opportunities to share with one another. I’ve already felt a difference in our relationship! If you and your man or lady are looking to take your relationship to the next level, I highly recommend this retreat! Not only was I pumped about this retreat, but I was also super excited because by the time we got home, the weather was starting to warm up…. I’m talking Spring temperatures! When that happens, I automatically want to whip out all of my spring clothes and recipes that remind me of summer. 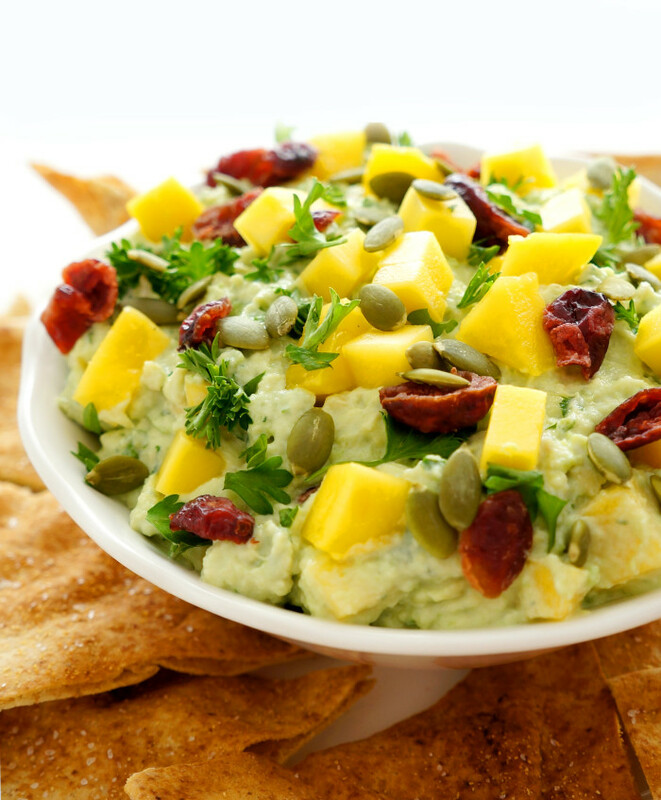 Like this Mango and Cranberry Guacamole! 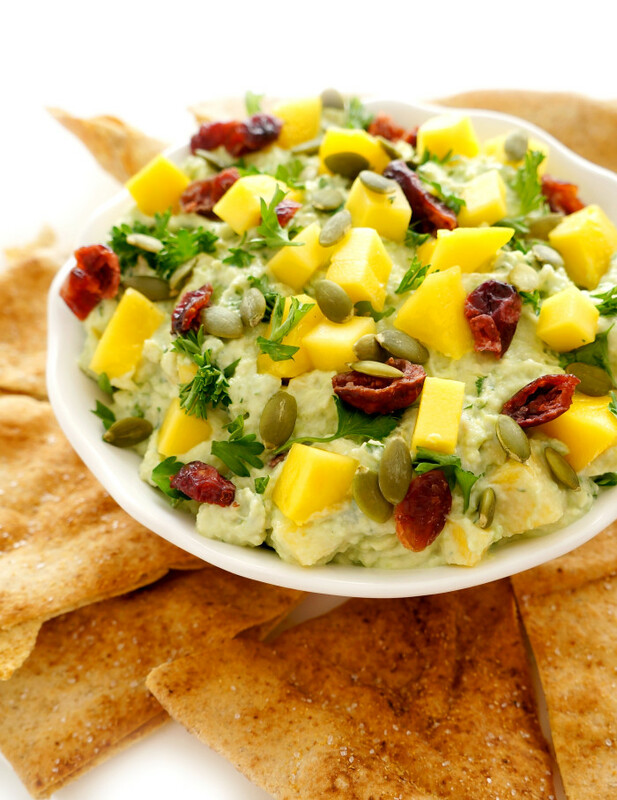 The combo is so refreshing with the sweet chunks of mango and dried cranberries and crunchy pumpkin seeds. Love it! 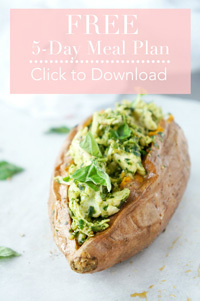 This guacamole is also unique because it has Greek yogurt in it which ups the protein and calcium content! Matt and I have been eating it with everything….homemade pita chips, salmon, burgers, chicken…anything that requires a little pop of flavour! In a large bowl, combine avocados and Greek yogurt. Mash with a potato masher or fork until smooth. Stir in lime juice, parsley and salt until well distributed. 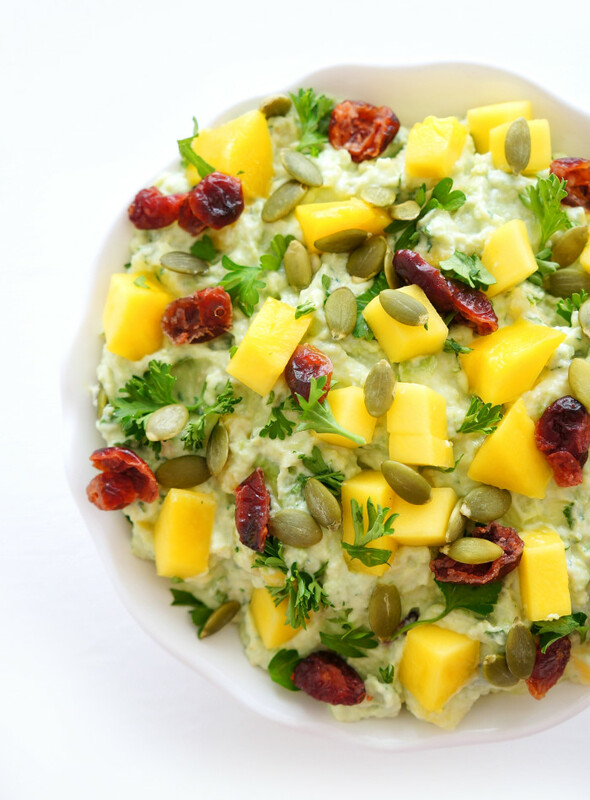 Add mango, dried cranberries and pumpkin seeds to avocado mixture and stir to combine. Place plastic wrap directly over surface and refrigerate until needed, for up to 2 or 3 days.